How Do You Vote Your Values? Please review the information below: The Lesser of Two Evils? Christians have been conflicted over several high-profile candidates where the choice between the Republican and Democratic candidate is not clear. And while there’s a third-party candidate who seems more aligned with a Christian worldview, statistically and realistically that candidate has no chance of winning. But as a Christian, you want to vote according to your Christian values and worldview…and honor God with your vote. Therein lies a dilemma. Abortion. Marriage. Religious liberty. These are a few of the nonnegotiable political positions that help determine your support for a candidate. Other issues important to Christians may include support for Israel, lowering taxes (vs. legalized theft), repealing Obamacare (among the many problems are the rationing of healthcare in a bureaucratic, government-controlled system and its abortion provisions), budget deficits (generational theft, creating the most immoral tax of all—inflation) and wasteful government spending. To Christians, their stances on these issues are inflexible. They go beyond politics…they are moral issues that will impact the future of our society as well as determine the type of world in which our children will grow up. Issues of life, building strong families, traditional marriage and pro-job/economic growth are fundamental to our belief system and a healthy society. Christian voter #1: Vote only on principle. You vote for a candidate, not against one. You only vote for a candidate who agrees with your nonnegotiable positions. Voter #1 feels this is the only way to have a clear conscience. If the opposition candidate—who is for taxpayer-supported abortion, against partial-birth abortion and against parental consent—wins because you, as a Christian, voted for a third-party aligned with your Christian values, that’s OK.
Why? Because God doesn’t measure us by who wins or loses, but by our faithfulness to vote our values without compromise. We honor God with our vote and let Him do the impossible. We are being faithful to what God has called us to do and leave the results in His hands. The practical side of this is the politics itself. The Democratic Party ignores or opposes Christians in the areas of abortion, marriage and religious liberties (and other important values). But increasingly the Republican Party is ignoring these issues as well. The Republican Party believes it need not worry about the Christian vote, because they will vote for the lesser of two evils. By voting for a third-party candidate or write-in, you are saying the lesser of two evils is…evil. And you are also saying that politicians should pay attention to the Christian vote and issues. Ignore us and you will lose the election. Christian voter #2: Vote for the greater good. This Christian voter disagrees with voter #1. This is the voter who believes in strategically avoiding or limiting the most evil. In the case of abortion, voting for a candidate opposed to partial-birth abortion and for parental consent, even if the candidate is for taxpayer-funded abortion, is a way to restrain evil and save lives. The principle of strategically avoiding the worst evil means that although you are not voting for a candidate who fully agrees with your views, you are choosing one who is better than the other candidate. Voting in a primary allows you to vote for the “near perfect candidate.” Voting in a general election, a third-party vote could be, in a sense, voting for the worst candidate—you’re actually indirectly voting for evil! Rahab, the harlot of the Bible, used this principle to protect Jewish spies. Corrie Ten Boom tells of the Nazis knocking on the family door and asked if they are hiding Jews. The higher moral ground was to protect life. It’s not a matter of “choosing the lesser of two evils.” As a Christian, we must never choose evil. Instead, your vote for the imperfect candidate is strategically used to limit evil—and that in itself is a morally sound choice. Your vote keeps the worst person from being elected—and doing even more harm. This is a good moral choice. You’re voting for some good positions—a morally good choice. You’re voting for more than just that position. For example, a Governor will appoint over 300 judges, commissioners and other important positions. The candidate most aligned to your values will appoint more people who are acceptable. Other tightly contested races have other important, although indirect, short- and long-term consequences. So as you vote, you are faced with those two choices of strategy as a Christian voter. And in our voter guide of recommendations, posted at http://www.electionforum.org/ we have given for some races a “1 thumb up,” or, “better than opponent.” They are either a Republican or Democrat who is better than their opponent to strategically restrain or avoid evil. In some races, a third-party candidate for the same office is given 2 or 3 thumbs up. That’s for those who wish to follow Christian voter #1. Yet for those who decide to vote this way, you must remember…the lesser of two evils is still evil. In cases where the third party gets a higher ranking, they won’t win. We will discuss elections like Governor, Lt. Governor and other races where we may be confronted by this moral dilemma. Subscribe and read Reality Alert for more information. Click here. 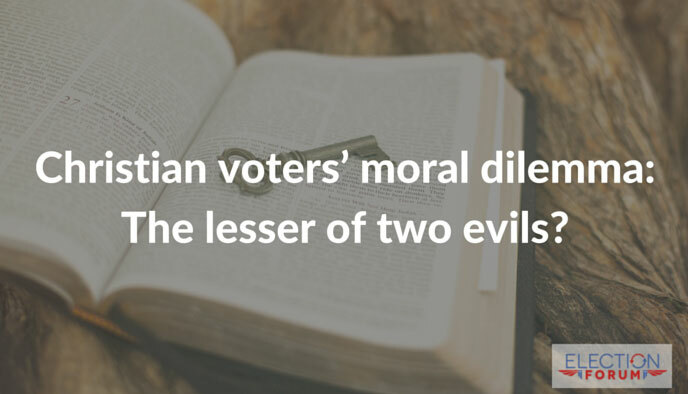 Voting for ‘the lesser of two evils’ as a RARITY evidences a failure on the part of Christians to find Christ worth representing in government has merit. Conversely, christians voting for ‘the lesser of two evils’ as a continuance of a decades long PATTERN, maintains America’s trajectory toward national-suicide. My claim extends outside the realm of opinion and into the realm of verifiable evidence when we examine what caused America’s existing morally, economically, and constitutionally emaciated, condition so offensive to God. America’s pending national-suicide is NOT caused by ‘establishment’ Democrats, ‘establishment’ conservative-impostors infecting the GOP like a cancer, or the like who merely do what godless people do in the absence of godly opposition. America’s pending destruction exists due to the post-1800s ‘Christ-void’ having been created in society and government by an edited version of Christianity that allows Christians to neglect there biblically mandated obligation to fulfill the Great Commission, aid the needy, oppose evildoers, and represent Christ in all things including government and society to the exclusion of godless world-views and governance. Christians rightfully judging Trump for his godless occasional rudeness must take responsibility for the fact that Trump only exists as a candidate because America’s lukewarm churches ensured Christians did not find Christ Worth representing enough to field a godly constitutionalist candidate. At what point will America’s shepherds repent for their not protecting their sheep both spiritually and physically by calling for representation of Christ in society and government, and not teaching the entire Word of God which makes clear that “faith without works is dead”? ‘Works’ not purchasing salvation, but ‘works’ to glorify Christ by ensuring godly and constitutional candidates are elected to office. If the pulpits of America, and those enabling them by attendance, do not begin engaging in ‘works’ evidencing their faith is true and not assumed, then we neglect a primary purpose for our creation – which is to glorify God with ‘works.’ ‘Works’ that should have precluded the murder of 55-million unborn children through abortion. Had a pre-1900s churches in this land ‘reasoned to inaction’ as those who claim Christ generally do today, there would not have been sufficient opposition to evildoers with representation of Christ to fight British tyrants and fight to end slavery. More voting for ‘the lesser of two evils’ which is highly offensive to God evidences a lukewarm faith not finding Christ worth representing in government. Couldn’t agree more. Like you say, the failure of Christians to represent their God in their own government was made clear when Craig Huey ran for office, and not enough Christians sought to represent Christ enough to make sure Craig was elected. That said, there were many godly Christian brothers and sisters who invested much time and money attempting to get Craig elected. it’s past time that we have some Godly representatives in our government buy and for the people of God. I agree in principle, but I don’t understand when you say not Godly constitutional candidates were running. I think there were several, including Ted Cruz. Valid question – there’s no brief way to answer this. Cruz, or any politician claiming conservatism, is NOT to be judged on his rhetoric, or only by his year old record which includes some good constitutional governance. Politicians are to be judged on the totality of their records of governance, and to a lesser degree, their associations. Judgment only possible when their record of governance and associations are held up to the ONLY TRUE MEASURE OF CONSERVATISM EXISTING OUTSIDE THE REALM OF OPINION. I say this because, the quickening ‘conservative-relativism’ infecting the GOP like a cancer over the past century has the GOP functioning as the lesser of two America destroying mainstream political parties – albeit destroying America slower and down a different path than Democrats. This requirement is what makes it tough for me to trust Trump for various reasons – but you did not ask about Trump. Using constitutional rhetoric, and engaging in a few constitutional acts of governance does not ensure the existence of a constitutionalist politician anymore then using Christian rhetoric and claiming to be Christian makes one a Christian (Matt. 7:20 – Therefore by their fruits [not rhetoric] you will know them). On March 8, Ted Cruz announced that Neil, the brother of former GOP contender and globalist ‘establishment-pawn’ Jeb Bush, would be joining his finance team. The problem isn’t that Cruz’s ‘inner circle’ is composed of those of vast foreign policy experience; the problem is their experience is in unconstitutionally growing government under the pretense of national security, and using American precious troops as global-cops, at times under the authority of the United Nations – an international version of a fireman/arsonist(I worked their during the Bush/Clinton period). As constitutionalists know, each of these endeavors pursued by Cruz’s global-engineering advisors is unconstitutional and not consistent with Ted Cruz’s public statements of ‘strict constitutional adherence’ presenting a trust issue. CRUZ’S WIFE: In 2005, the ‘global-governance con-artist’ that is the Council on Foreign Relations released a document called “Building a North American Community,” a report outlining the global-engineering CFR’s quest to create a ‘North American Union’ based on the tyrannical model of the European Union. A system of regional-governance necessarily eventually eliminating United states sovereignty while claiming no such intent, by requiring the United States to submit to the rules and regulations of this ‘regional governance’ body. The report identifies its aim as detailing an “ambitious set of proposals that build on the recommendations adopted by the three governments at the Texas summit of March 2005. The Task Force’s central recommendation is establishment by 2010 of a ‘North American economic and security community,’ the boundaries of which would be defined by a common external tariff and an outer security perimeter.” Typical rhetoric by global-engineers deconstructing the sovereignty of nation-states in favor of regional, then eventually global governance, under the pretense of regional security. Heidi Cruz’s involvement? Mrs. Cruz was a member of the ‘Task Force’ that was tapped by the CFR to analyze the proposals for the establishment of a ‘North American Union’ as set out in a report called “Building a North American Community,”. Beginning on page 33 of the report, Heidi Cruz provided her assessment of the NAU proposal: “I support the Task Force report and its recommendations aimed at building a safer and more prosperous North America. Economic prosperity and a world safe from terrorism and other security threats are no doubt inextricably linked.” She is on record as supporting “recommendations aimed at building” a North American union. A regional governance scheme put together by both ‘establishment’ democrat-socialist/globalists and ‘establishment’ conservative-impostor/globalists infesting the GOP like a cancer who use conservative and Christian rhetoric like a veneer to hide their globalist nature. America’s Century long emaciation at the hands of ‘establishment’ democrat-socialists/globalists and ‘establishment’ conservative-impostors and their useful-pawns infecting the GOP while being given cover by their accomplices on FOX News, make clear that continuing to vote for ‘the lesser of two evils,’ instead of ensuring restoration which is only possible with constitutionalists, is the functional equivalent of taking cyanide to remedy a migraine. The GOP must be cleansed of the conservative-impostors and other constitutional-deconstructionists like infesting it, or there is no hope for America’s survival. Moreover, with Cruz and Trump, we see the dialectical decades long pattern of electing ‘the lesser of two evils’ sustain America’s trajectory toward national-suicide with restoration nowhere in sight. It feels like we’re living in the twilight zone with this 2016 election. If the 66 MILLION “committed Christians” would actually vote BIBLICAL VALUES, we’d be electing Sen. Ted Cruz for POTUS! As it is now, high profile Christians like Jerry Falwell, Jr.. and CBN’s Pat Robertson have sold their souls in endorsing Donald Trump. I’ve heard the same pathetic excuses of supposedly committed Christians who have supported Trump — “Well, I like Ted Cruz, BUT I want to win in the general election.” Well, facts, truth and logic are a funny thing ya know. If Christians would actually vote BIBLICAL VALUES and actual RECORDS, Trump would not have made it this far and we’d be electing a true godly man in Sen. Cruz. Trump knows no level to which he’ll stoop. Trump makes Obama look presidential, which is pathetic. Sadly, those of us who are intelligent will pay the price for the stupidity, fear and ignorance of those who are not voting God’s word. May God bless the USA! Then why even bother voting for a third Godly candidate that you know is going to lose? It is waste of time. Yeah, you are voting values, but it doesn’t accomplish anything. And it doesn’t send a Message to anyone because they aren’t listening. This is war of Light vs. Darkness. My vote and sword is against the greatest force of darkness. We vote for a third party candidate because my responsibility is not controlling outcomes, nor is my goal winning. My goal is to always do what is right and to always support God-honoring things, not to support less-evil things that are evil. The outcome is based on if others in this country choose to serve and honor God and God’s decision to either deliver us from the evil we choose or judge us by giving us the evil we long for and embrace. 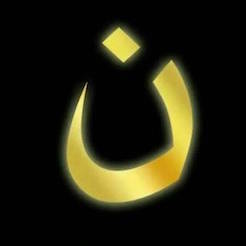 You people seem to forget that we’re NOT trying to bring the “Kingdom of Heaven” down to earth. NO candidate is a perfect “Christian” candidate, period. We, as Christians, have to be pragmatic, and vote “the lesser of two evils”. Every candidate has something that we don’t agree with. Sure, it “feels” good to vote for a third-party candidate who has no chance of winning, but what good is that? That’s almost the same as not voting at all. We HAVE to minimize the evil, not eliminate it. The past century of the GOP politics makes clear that voting for ‘lesser evils’ instead of ‘imperfect yet godly constitutionalists’ results in ‘lesser destruction.’ Thereby creating a dialectical slide toward national-suicide as Democrats destroy us at light-speed and ‘establishment’ constitutional-deconstructionist infecting the GOP like a cancer destroy us slower. For decades Christian’s voting for constitutional-schizophrenics in the GOP have brought ‘lesser destruction’ but never substantial restoration, while Democrats always bring destruction. The biblical obligation for Christians to represent Christ in society and government is not satisfied by opposing evil alone. Christ must be represented in society and government to the exclusion of competing worldviews and governance, along with opposing evil. This, because our continual pattern of ‘the lesser of two evils voting’ alone is tantamount to offering someone greater and lesser doses of cyanide to cure a migraine, when only healthy cures prevent death. The past century of Christian voters attempting to ‘minimize the evil’ without having a set of uncompromising biblical and constitutional absolutes, along with the pulpits not admonishing their sheep of their obligation to represent Christ in government, has had the GOP winning elections while actually contributing to America’s destruction. This, because didactically electing a constitutional-deconstructionist GOP candidate to ensure a Democrat is not elected only brings lesser and different types of destruction. While your broad claim is true, for it to be relevant to our present situation it requires detail. America has since its founding evidences a ‘break-point’ regarding ‘minimizing evil/representing Christ,’ as it relates to America either maintaining a trajectory toward prosperity or destruction. Above the break-point of ‘minimizing evil’ AND representing Christ in society and government America maintains a trajectory toward prosperity. Below the break point for minimizing evil whereby Christians fail in their biblical obligation to represent Christ in society and government our constitutional-republic maintained on a trajectory toward national-suicide. Add to the presidential issue, the fact that ’establishment’ conservative-impostors provide intermittant fake-opposition to Democrats as evidenced by our existing congressional GOP leadership, and we see the results of ‘lesser of two evils’ voting tactics as America’s destruction continues. Unlike pre-1900s Christianity which engaged in ‘works’ early in the primary election process to field godly constitutionalists, today’s version of Christianity does not find Christ worth representing in government. Instead, today’s Christians wait to see which ‘establishment’ conservative and Christian talking constitutional-deconstructionist and global-engineer will be hand-fed to them by the ‘establishment’ media and corrupt GOP leadership. At which point, instead of having a godly constitutionalist bringing restoration to America, we are once again stuck with a constitutional-deconstructionist merely bringing ‘less evil/destruction’ then would a Democrat. Consider God’s view of what we 98 million citizens claiming Christ are doing as we destroy the very nation god blessed us with by engaging in a pattern of voting for ‘the lesser of two evils’ instead of electing ‘the greater of two imperfect yet godly constitutionalists’? I always vote for candidates I don’t agree with because I am not sure there is any person in the world I always agree with. This issue is not, “don’t agree with everything” or ” imperfect.” There are some candidates that are morally reprehensible and the are dishonoring to God. Has nothing to do with different policy opinions, or not a perfect person. And I have never had a requirement that a candidate be a Christian. I could not care less. But, we DO have a responsibility not to participate in things that are evil, or if that is an overstatement, dishonoring to God and immoral. We don’t do immoral things to get an outcome. We don’t look at politics as different than any other area of our life. We should live with the same set of values in everything we do. Also, character does count and we should always seek to support leaders with character and integrity. In other words we don’t do unrighteous things to meet legitimate needs. We do our best and work hard and then trust that God will provide for our needs or accept the judgement from His hands. And in that vein, being as “faith without works is dead,” and given that there are 78 million Catholics and 20 million Evangelicals claiming Christ in America, there is no excuse for our shepherds not protecting their flocks both spiritually AND PHYSICALLY by admonishing their flocks of their obligation to represent Christ within the context of our constitutional-Republic form of government. Which should easily result in imperfect yet godly constitutionalist candidates being elected – which are the only politicians capable of bringing restoration from a purely political perspective. This, as opposed to the ‘Christian and conservative’ claiming ‘establishment’ constitutional-deconstructionist fixated on global engineering, trade agreements having functioned like the proverbial ‘floodgates opening’ allowing America’s manufacturing and production (and therefore our middle-class) to pour out of America and into corrupt socialist nations, GOP politicians not providing fake-opposition two Democrats by not using available congressional rules and other forms of governance as Democrats due to Republicans, and the like. I also agree with you on another point. I will vote for an atheist constitutionalist before I will vote for an ‘establishment’ constitutional-deconstructionist claiming conservatism and Christianity. This, because only the constitutionalist can bring restoration. The only true measure for a ‘political conservatism’ within the context of our constitutional republic is ‘the original intent of America’s amended constitution.’ Using this as our measure, anyone believing both presidents Bush were conservative by any stretch of the imagination has little concept of that which constitutes ‘true conservatism’ by definition. These men did not engage in mere ‘imperfect governance,’ but placed their global-engineering agenda before America in direct violation of their oath of office. Something for which they were given a free-pass because they used Christian and conservative rhetoric, and were given cover by their accomplices in the ‘establishment’ media who labeled them as conservative to continue the deceptive dialectic occurring between ‘establishment’ democrats and ‘establishment’ republicans who function as ‘two opposing sides to the same America destroying coin’ — as evidenced by our nations economic and constitutional emaciation occurring quickly with ‘establishment. democrats and slower and in different ways with ‘establishment’ republicans. In the meantime, those who either ‘reason two inaction’ by ignoring what caused America’s emaciation, or those with a vested interest in continuing America’s deconstruction in favor of a United nation’s based system of global governance, label people speaking the truth about what has caused Americas deconstruction as ‘conspiracy theorists’ as to ensure truth is silenced and the status-quo is maintained. One thing I can state with a 100% certainty, is that having read 72 sermons recorded between the years 1620-1900, the difference between the pulpits of America then and today could easily lead one to believe they are two different religions. Pre-1900s Christianity having a healthy fixation on glorifying Christ through ‘works’ as if “faith without works is dead.” And today’s Christianity which reads and talks about Christ, yet functions as if ‘faith without works is alive.’ And while representing Christ in government is a lesser priority then the family, society, and the like, it is a priority none the less if our children and grandchildren are to inherit usable God given rights from us instead of the tyranny that results from a lukewarm Christianity that refuses to do the work necessary to field and elect godly constitutional candidates. To be sure, God is unlikely to reward lukewarm Christians with restoration of America, when their failure to obey God by representing him in Society and government to the exclusion of competing worldviews and governance continues without repentance followed by ‘works’ evidence thing their faith is true and not merely assumed. The only reason America exists in its emaciated and God offending state as it nears destruction, is that the enemies of Christ are willing to invest more effort in securing their worldview, then Christians are willing to invest in representing and glorifieng Christ. Had pre-1900s American Christians acted like today’s Christians, British tyrants and slavery would never have been fought, and America would never have been founded. Time to wake up our shepherds who slumber as the sheep are ‘consumed by wolves claiming Christianity and conservatism’ in both our churches and the GOP. May God richly bless you & your family.